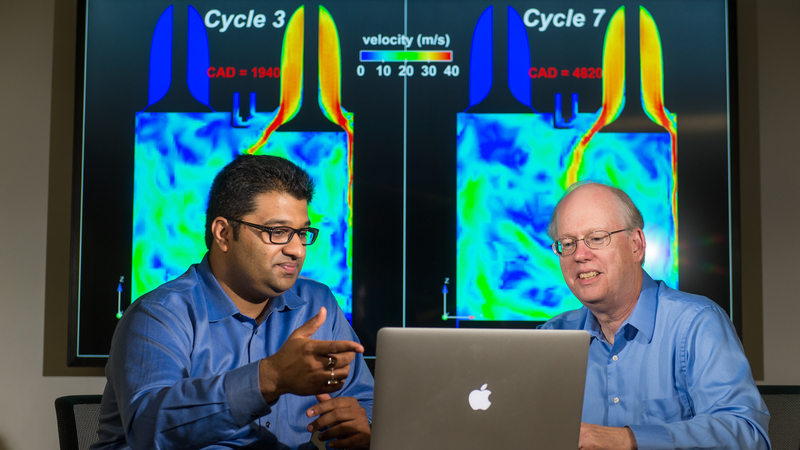 Argonne principal mechanical engineer Sibendu Som (left) and computational scientist Raymond Bair discuss combustion engine simulations conducted by the Virtual Engine Research Institute and Fuels Initiative (VERIFI). The initiative will be running massive simulations on Argonne’s Mira supercomputer to gain further insight into the inner workings of combustion engines. When you’re trying to understand the complex inner workings of a virtual engine, with its millions of variables and untold number of uncertainties, the most important horsepower number isn’t the one under the hood; it’s the one in the computer rack next door. Researchers at the U.S. Department of Energy’s Argonne National Laboratory will be testing the limits of computing horsepower this year with a new simulation project from the Virtual Engine Research Institute and Fuels Initiative (VERIFI) that will harness 60 million computer core hours to dispel those uncertainties and pave the way to more effective engine simulations. The work will be conducted on MIRA, which is currently the fifth-fastest supercomputer in the world and serves as the epicenter of the Argonne Leadership Computing Facility (ALCF), a DOE Office of Science User Facility. VERIFI has been working for two years to gain a deeper understanding of the complex dynamics at work in engine combustion. While VERIFI has used powerful computers before, it has never accessed a computer with the horsepower of MIRA and the abilities to unlock the deepest secrets of combustion. The work will be conducted on MIRA, which is currently the fifth-fastest supercomputer in the world and serves as the epicenter of the Argonne Leadership Computing Facility. The research will focus on investigating how multiple variables, or uncertainties, interact simultaneously to impact the functioning of an engine. The variables in an engine are vast and include such things as temperature of cylinders and pistons, pressure inside the cylinder and flow rates of fuels. Tiny changes in any of these conditions can have profound effects on engine performance and emissions. In the past, slower computers allowed researchers to change one variable to see how it affected the rest. With a supercomputer, the Argonne team will be able to change all of the variables simultaneously and simulate the impact each has on all the others. The overall simulation effort will likely involve about a million calculations to resolve all the variables. By resolving the uncertainties in engine simulations, the Argonne team will be providing vehicle manufacturers and engine designers with the tools to create more efficient engines faster and at reduced cost. The results from the study will be released publicly and will also be integrated into the CONVERGE engine simulation software created by Convergent Science, Inc.
A primary focus of the research will be enabling a new generation of gasoline compression engines that operate on the basis of low-temperature combustion. A gasoline compression engine combines many of the benefits of diesel and gasoline engines by using compression to ignite the fuel in the same manner used by diesels. Vehicle manufacturers have shown interest in pursuing low-temperature combustion as an innovative route to more efficient engines. The project is funded by DOE’s Office of Vehicle Technologies within the Office of Energy Efficiency & Renewable Energy.